charismatic Kurt Russel) as they make their way to Red Rock to claim a few bounties, totaling $18,000. As you may have guessed, this creates a bit of a conflict between Ruth and the Major, as they both, although acquainted with each other, are distrusting. As they make their way to the small town, they pick up the ignorant, yet humorous Sheriff of Red Rock Chris Mannix (played by Walton Goggins). Together this band of men, brought together by a fierce snow-storm, find a small bed and breakfast where the “protagonists” are met by a group of suspicious men who are staying at the little B&B. There's a sneaky and rather cryptic Mexican (Demian Bichir) who calls himself Bob, a former Confederate general (Bruce Dern), a smug and effete British hangman (Tim Roth), and a smirking gunman named Joe Gage (Played by the charming Michael Madsen). Together, this odd bunch are forced to spend at least a three days inside the inn with one of the bounties that is worth 10,000 dollars. As they settle in though, things are not what they appear to be, Kurt Russel and his companions begin to suspect that one, if not all the men in the inn are to kill and take the bounty for themselves. There is a strong buildup, followed by an explanation that relaxes the viewer, then hits you with a climax filled with plot twists that make for a very enjoyable, yet surreal experience. Now, the N-word is sprinkled throughout (Which shouldn’t come as a surprise to Tarantino fans, but is something to note if sensitive to the word) as Tarantino did set the plot in the years following the civil war; but its use in "The Hateful Eight" is more problematic than in "Django Unchained" where the term had a whiplash sting; even if you suspected Tarantino of trying to get away with something, the film's righteous ire (presenting the old South as a brainwashing, ignorant little Nazi Germany right here in the good old USA) made you pause before writing him off as an opportunist. That's not the case here. The in-depth conversations about the Civil War and what defined justice vs. frontier justice are superficially interesting, until you suspect they're not there to tie the film's characters to the image American, but to set the stage for killings. The context of a nasty, brutish time gives the artist permission to be nasty and brutish. When the violence arrives in "Hateful Eight," it's unmoored not just from any morality espoused by the characters (who are hateful, after all!) but also, it seems, from Tarantino's own moral compass—if indeed he has one, and after this movie I have serious doubts. In "The Hateful Eight" for the first time in Tarantino's career there's no detectable moral framework to speak of. It adds a shade of nihilism that is present from the moment we meet Russel from his stage coach. Now, keep in mind, this film is rated R due to its excessive violence, language, and explicit material, so viewer beware. 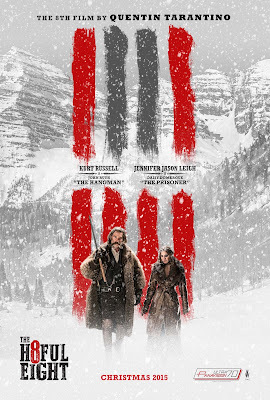 Overall, “The Hateful Eight” proves that Tarantino is like many people who reach a point in their life where they seek more, and make an effort to find try new things. This film is experimental, fresh, and will find its place among one of Tarantino’s less acclaimed films.